1938 was still two decades away from when America would launch its first Earth-orbiting satellite (Explorer 1, 1958) and three decades from when man would first walk on the moon (Apollo 11, 1969), yet work was well underway by enthusiastic aerospace engineers, scientists, astronomers, project managers, and others to accomplish those goals. While this Boys' Life article boasts of rockets attaining speeds of 800 miles per hour, leaving Earth's gravitational pull for a trip to the moon would require a escape velocity of 25,000 miles per hour. Telescopes powerful enough to survey the moon's surface for determining a safe location for landing were being readied with telescopes like constructed 200-inch Hale reflector, having seen first light just nine years earlier. 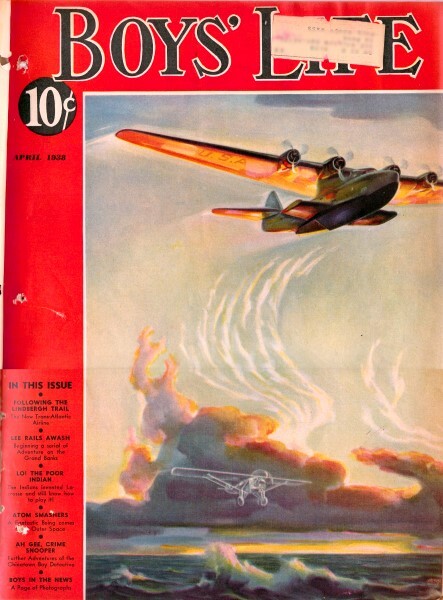 This type illustrated feature page was common each month. Exploring the stratosphere and literally reaching for the moon is the objective of the American Rocket Society, Inc., with offices in New York City. Things actually move so fast in this field of scientific experimentation that almost before a rocket is dispatched into space, it is made obsolete by an entirely new type that meanwhile has been invented (1) Here is one of the latest types being adjusted preparatory to firing. (2) At the proving grounds showing the rocket in position for firing with its charge of liquid fuel being added. (3) America has devoted most of its attention to liquid fuels, which leave no spectacular wake of smoke as do the dry fuel rockets of Germany. (4) Dr. G. Edward Pendray and his associate John Shesta of the American Rocket Society are photographed inspecting a new type of rocket destined for an interstellar trip. (5) Nearly every other nation has its group of interplanetary space enthusiasts corresponding to our American Society; here in Japan enthusiasm runs high as this rocket is launched somewhere outside of Tokyo. 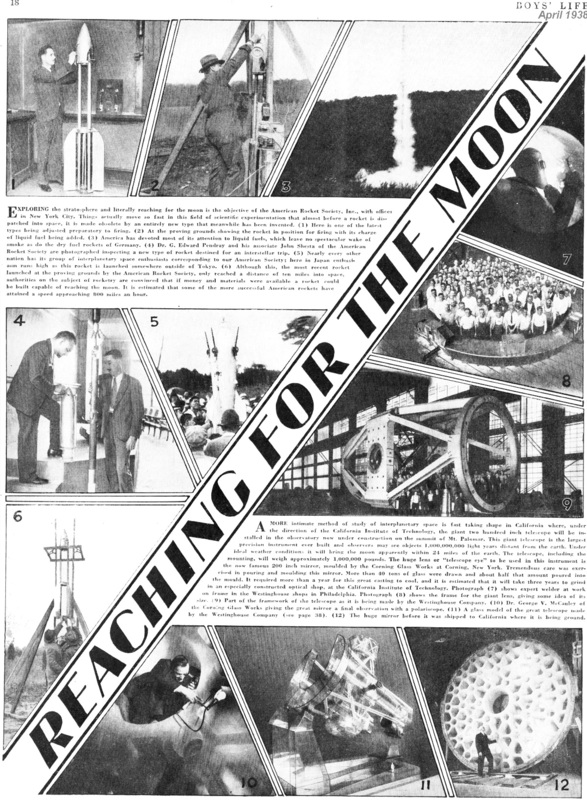 (6) Although this, the most recent rocket launched at the proving grounds by the American Rocket Society, only reached a distance of ten miles into space, authorities on the subject of rocketry are convinced that if money and materials were available a rocket could be capable of reaching the moon. It is estimated that some of the more successful American rockets have attained a speed approaching 800 miles an hour. A more intimate method of study of interplanetary space is fast taking shape in California where, under the direction of the California Institute of Technology, the giant two hundred inch telescope will be installed in the observatory now under construction on the summit of Mt. Palomar. This giant telescope is the largest precision instrument ever built and observers may see objects 1,000,000,000 light years distant from the earth. 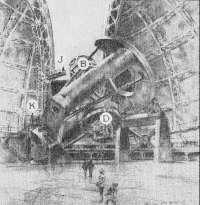 The telescope, including the mounting, will weight approximately 1,000,000 pounds. 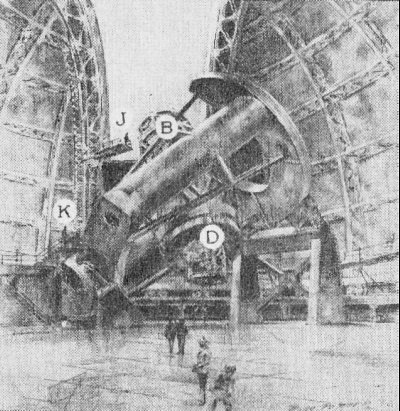 The huge lens or "telescope eye" to be used in this instrument is the now famous 200 inch mirror, moulded by the Corning Glass Works at Corning, New York. Tremendous care was exercised in pouring and moulding this mirror. More than 40 tons of glass were drawn and about half that amount poured into the mould. It required more than a year for this great casting to cool, and it is estimated that is will take three years to grind in an especially constructed optical shop, at the California Institute of Technology. (7) shows expert welder at work on frame in the Westinghouse shops in Philadelphia. (8) shows the frame for the giant lens, giving some idea of its size. 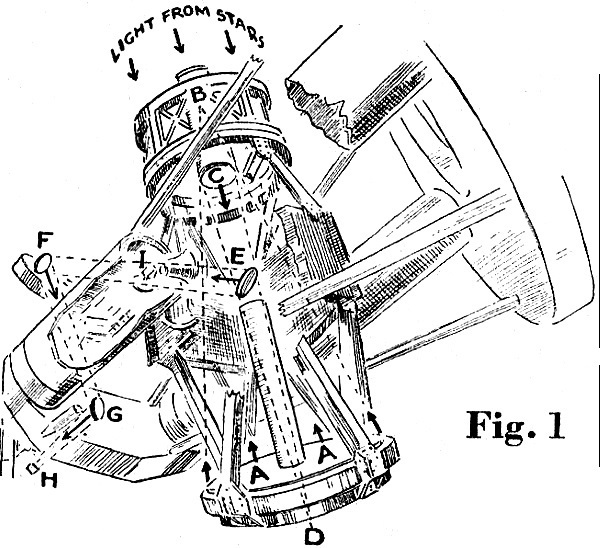 (9) Part of the framework of the telescope as it is being made by the Westinghouse Company. (10) Dr. George V. McCauley of the Corning Glass Works giving the great mirror a final observation with a polariscope. (11) A glass model of the great telescope made by the Westinghouse Company (12) The huge mirror before it was shipped to California where it is being ground. I is another point of focus, and down inside the huge arm (an open section of which is shown) is a chamber for spectrographic work. These arms on each side of the tube are parallel to the polar axis. The control board is located at K (Fig. 2). The great housing running at nearly right angles to the telescope is the counter weight to the telescope. It permits the giant apparatus to be moved and aimed With delicate control.